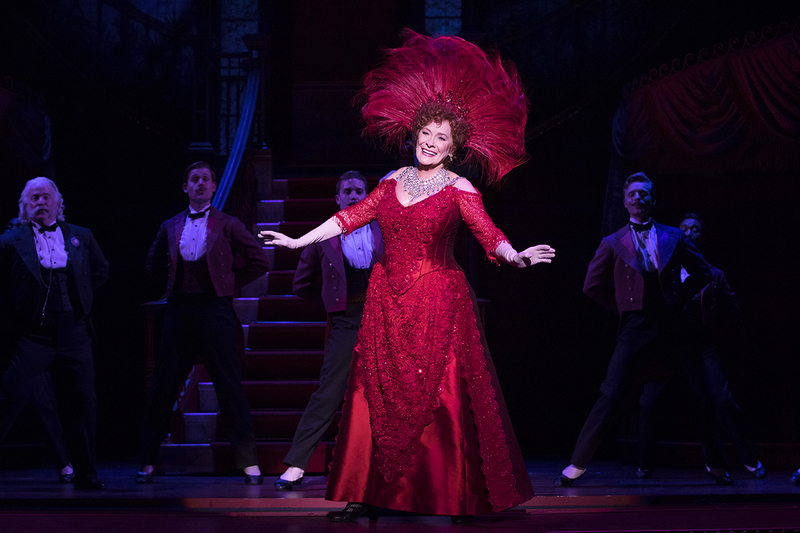 It was apparent on reviewer’s night of Hello, Dolly!, which is starting its national tour in Cleveland, that many of the audience, which was awash in red clothing, had heard of the “wear David Merrick red” to productions of this script. David Merrick red? 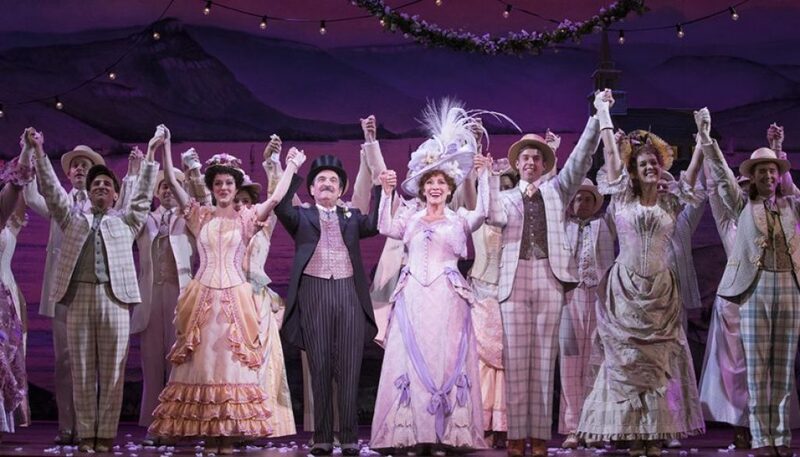 Supposedly, Merrick replaced the front curtain of the theatre in which his Hello Dolly! was to play with a red one of a particular rouge hue. In addition, the lead character, Dolly Levi, in her most spectacular scene of the show, makes an entrance coming down a staircase in the Harmonia Gardens Restaurant wearing a red gown, a dress which became the traditional costume choice for all future Dollys. 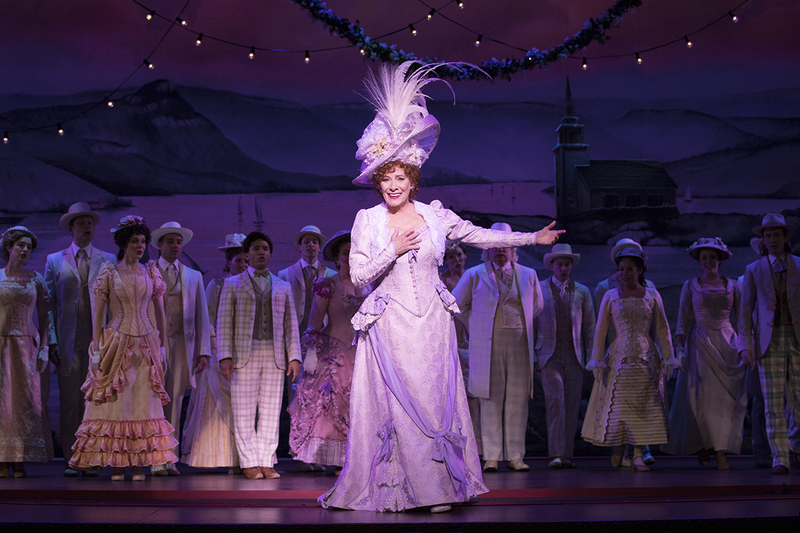 Hello, Dolly!, which has lyrics and music by Jerry Herman and a book by Michael Stewart, is based on The Matchmaker, a 1954 play by Thornton Wilder. Wilder issued the work as a rewrite of his 1938 play The Merchant of Yonkers. 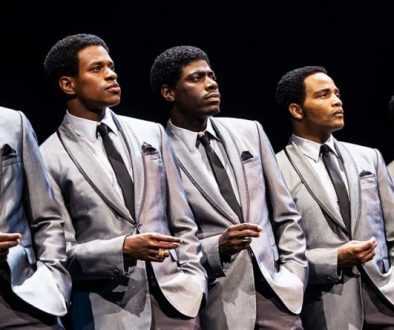 First produced in 1964, the musical won the Tony Award for Best Musical. Interestingly, though most think of Carol Channing as Dolly Levi, the role was originally written for Ethel Merman, who elected not to do the part. The role was then offered to Mary Martin, who also declined. Eventually, Channing was hired and not only had the role associated with her for life, but helped to forge the show into an international hit. 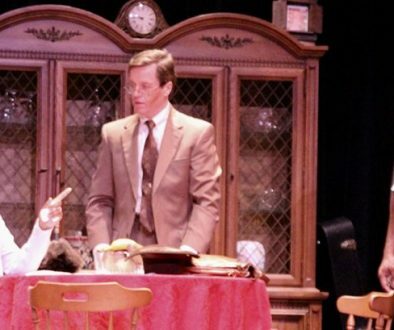 You’d never know it due to its amazing long-running Broadway runs, revivals, and local and international productions, but the show had rocky out-of-town tryouts. Major changes were made to the script and score. Even the name of the show was changed. 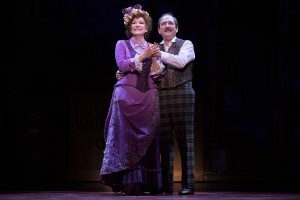 Originally entitled Dolly, A Damned Exasperating Woman and then Call on Dolly, Merrick finally settled on Hello, Dolly!” and musical theater history followed. The story centers on a meddlesome widow who, out of need for money, and her natural exuberance for controlling others and searching for a satisfying life, turns to matchmaking, striving to bring romance to others as well as herself. 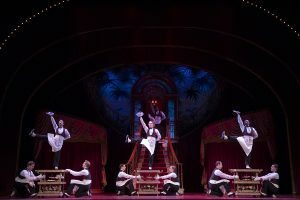 The memorable score includes such hits as “It Takes a Woman,” “Put on Your Sunday Clothes,” “Before the Parade Passes By,” “Elegance” and “It Only Takes a Moment.” It is filled with joyous dancing and lots of audience-pleasing showstoppers, notably “The Waiters’ Gallop” and the title song. The scenery, mainly colorful curtain drops, which are needed to facilitate easy moving from theater to theater on the tour, set the right moods. A full operational massive horse and carriage and a locomotive brought extended applause. Many probably saw Jess LeProtto (Barnaby Tucker) on “So You Think You Can Dance.” He has a long theatrical resume including Broadway’s Newsies (in which I found him commanding many of the dance routines in the show). He sings, dances and clowns with infectious ease. CAPSULE JUDGMENT: The sold-out opening night audience got what they came for: Betty Buckley, enthusiastic dancing and singing; a spectacle in the form of wonderful costumes and special effects, some laughs, and lots of wonderful music! 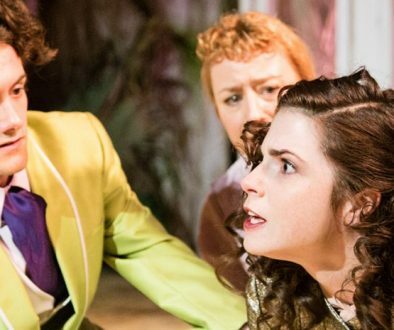 Not all theater is intended to tell philosophical and meaningful ideas. Sometimes it is just nice to go and enjoy, feel warm and happy, and appreciate the joys of life! Do see Hello, Dolly! 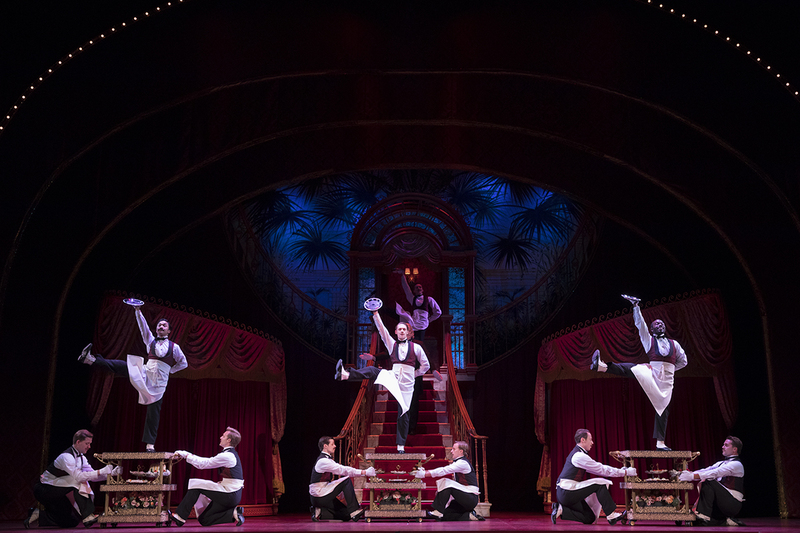 Part of the Key Bank Broadway series, “Hello, Dolly” runs through October 21, 2018 in the Connor Palace, in the Playhouse Square complex. Next up in the series is a newly conceived version of “Les Miserables” from October 30-November 18, 2018. For tickets call 216-241-6000 or click here.